This article is a study of the commercialization practice of secret marriage in Pekoren Village, Rembang Subdistrict, Pasuruan Regency, East Java Province. Secret marriage is carried out by the community using a broker service. In carrying out its duties, the broker asks for payment in the form of dowry money for operational costs and paying for the services of the Kyai who marry off. 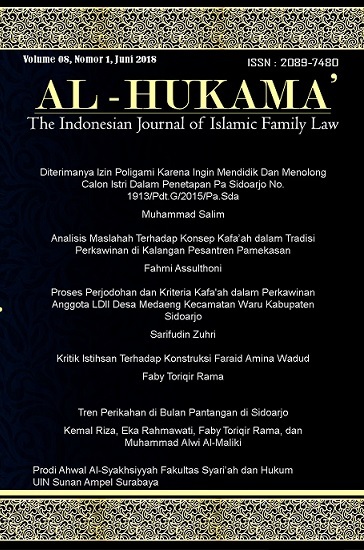 This case was analyzed using the eyes of Islamic law and juridical law. While the method used is a descriptive qualitative research method by collecting data through reading or reviewing the expressions and behaviors observed from the speakers in the field. From the field it is described, that the commercialization of secret marriage in Pekoren Village is a fixation of the price of dowry as an operational cost that uses the services of kyai and brokers to find the type of women wanted by interested person. In Islamic law, secret marriage is a legal marriage with the fulfillment of requirements and pillars of marriage. Brokers in this case can be categorized as buying and selling because of doing business, but it is still not suggested in Islam. In Positive Law, unregistered marriage is not valid because one element is not fulfilled, namely marriage recording. In line with these conclusions, the holders of the marriage registration policy must emphasize the regulation of marriage registration. For religious leaders, should not facilitate the secret marriage ceremonies which are patterned as pleasure.